Managed more than 13,000 employees, construction workers working in Bulgaria, Russia, Czech, the former Soviet Union, and Iraq. Operated in the field of import - export, and labor export. Was the first state-owned corporation to implement the Government's pilot equitization program. Operated in a wide range of business areas, such as property development, construction, consultancy service for investment - design and planning survey, import and export of (both construction and other) machinery, equipments, and materials, industrial production and construction materials, expert and labor export. To date, VINACONEX manages more than 40 subsidiary companies and affiliates, contributes capital in 5 joint venture companies and 14 affiliates in various business areas nationwide. VINACONEX employs more than 40,000 well-trained and experienced engineers, experts and workers. Along with the long-term business development, VINACONEX will focus on two main business areas: property development and construction, which are strengths and competitive advantages of the corporation. Besides that, VINACONEX also continues engaging in other business areas together with subsidiary companies, affiliates, and joint venture companies, such as industrial production and construction materials, design consultancy, labor export, trading service, financial investment, education and training, and other fields. 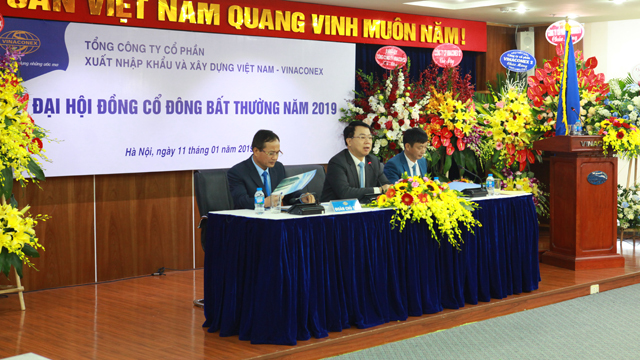 After the State completed divestment in VINACONEX in December 2018, VINACONEX held the Extraordinary Shareholders' Meeting to replace 7/7 members of the Board of Directors and 5/5 members of the Supervisory Board for the 2017-2022 term.